Syracuse University College of Law opens the first comprehensive veterans legal clinic in New York providing free legal assistance to veterans facing issues related to their veteran and military status. … The Veterans Legal Clinic at Syracuse University is the first and only comprehensive legal clinic in New York providing free legal assistance to veterans as they apply for benefits from the Department of Veterans Affairs (VA), appeal adverse VA decisions, and attempt to upgrade their military discharge. “Syracuse University has a long history of educating veterans and the College of Law continues that tradition by providing necessary legal help in navigating what can be complex issues within VA claims,” said Syracuse College of Law Dean Hannah Arterian. Syracuse Law alumni Tom Caruso, L’14 [a 2014 graduate of INSCT’s Curricular Program in National Security and Counterterrorism Law], and Josh Keefe, L’14 [a 2014 recipient of INSCT’s Certificate of Advanced Study in Security Studies] helped create the Veterans Legal Clinic. Their efforts began as first year law students when they met and founded the student group VISION (Veterans Issues, Support Initiative and Outreach Network) and also created Valor Day where Central New York veterans can obtain a range of free professional services. Through their determination and commitment to veterans issues, Caruso and Keefe have been focused on the funding and successful launch of this program before each returns to active duty as judge advocates for the United States Navy and Marine Corps. The lack of access to legal services has a tremendous impact on veterans and military families. According to a recent survey by the VA, five of the top ten unmet needs of vets are legal in nature. Currently, there are nearly 600,000 unprocessed VA disability claims causing veterans to wait up to two years for compensation. 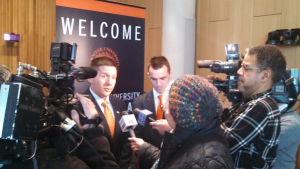 (L to R) INSCT alumni Josh Keefe (LAW ’14) and Tom Caruso (LAW ’14) brief the press on the new Veterans Law Clinic at SU College of Law.